MindSEO S.O.N.A.R. - The SEO Tool of SEO Tools. S.O.N.A.R. is a Digital Intelligence Platform, focused on technical SEO, that tracks websites and specific digital ecosystems. S.O.N.A.R. crosses all gathered information with multiple third-party APIs, through its own algorithms, in order to maximise insights. The main capability of S.O.N.A.R. Tools is to help organisations optimise their online presence in a more efficient way, increasing search engine visibility and maximising online marketing results. S.O.N.A.R. is a web-based application that offers countless features to help you improve your digital presence. Crawls your website and performs technical SEO audits, tracking its optimisation status and producing various insights about found issues that need to be solved, allowing you to improve your website quality and performance. Configure alerts to be instantly notified if your website faces negative ranking changes, technical issues like broken links and missing important backlinks. Empowers you to optimise your content marketing strategy. Get insights from content trends and support for content editors and copywriting teams. Monitor, plan, manage and optimise content that is ranked, linked and shared by others with the help of tools like Keyword Research, Landing Page SEO, Rank Tracking, Google Search Analytics, Social Media and Web Buzz Monitoring tools. Benchmarks your main competitors and provides you with several Competitor Spy tools and insightful reports in all S.O.N.A.R. main group features. Spy on competitors – search keywords related to any domain or page and discover which ones your competitors may be targeting to, evaluates your competitor's traffic and rankings, their link profile, the websites linking to them and their social citations, posts and engagement. Allows you to monitor your brand awareness and web buzz based on chosen keywords, as well as your social media engagement and mentions – likes, comments, shares, tweets, etc. Also, retrieve several user interactions insights from your Facebook pages and from your competitor’s ones. Thus, it gives you insights on what people like, comment and shares most, see the most popular content, etc. It also enables you to detect and create lead opportunities and enrol in conversations, to increase engagement rate. 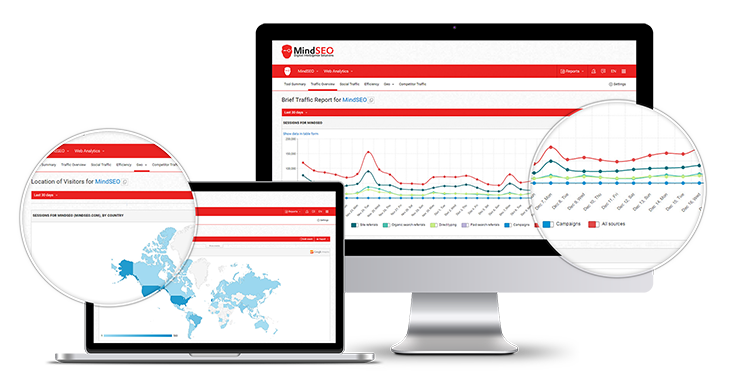 Monitors your website traffic sources (site referrals, organic search referrals, direct typing, paid search referrals, campaigns and social), its efficiency and geo-location. Also, provides traffic efficiency reports, analysing from goals and eCommerce metrics to new sessions and bounce rates. The data is displayed in several formats, compiled in tables and interactive charts and presented in a simple and intuitive way. Produces insightful reports in one-click and allows you to export them directly to email, PDF or CSV. You can create and customise consolidated reports by choosing data from specific tools, for one or more websites you manage in S.O.N.A.R. Tools. Schedule automatic report mailing or email them manually on demand. You can also fully-brand your reports to share them with colleagues, partners or clients. Provides you link analysis and acquisition/removal tools that help you optimise your link building strategy, to achieve bigger success in terms of traffic and ranking. Also, manage and optimise your website's link structure with the internal links optimisation tools. This helps search engines understand which pages are really important. It also monitors the quality status and effectiveness index of valuable links that you decide to track. Keep a historic registry of the main events that may affect your website’s performance, like dates of corrections and website improvements, finished SEO tasks, major Search Engine algorithms updates, press releases and inbound/outbound marketing events. You can monitor how events impact the website in several S.O.N.A.R. Tools, as well as retrieve valuable insights to help you understand what might be affecting your website optimisation status and/or traffic evolution. Start by connecting S.O.N.A.R. Tools to your Google Analytics and Google Search Console accounts. If you have one or more Facebook Pages, activate Facebook Insights for that pages too – this only requires one-time configuration. Once connected, S.O.N.A.R. crawls your entire website and its digital ecosystem, combining all gathered information with other data from several certified online sources trough third-party API's, in order to produce valuable reports and insights. Once the reports are ready, you can start correcting the technical SEO issues found, optimise your Content Marketing and Link Building/Management strategies, benchmark your competitors and monitor your website traffic and rankings. All the most valuable SEO Tools and Digital Marketing Solutions integrated in one single, easy to use platform. S.O.N.A.R. comes with over 60 features at your disposal. Focus your efforts on the aspects that matter and start improving your website's performance. If you are interested in MindSEO S.O.N.A.R. contact us now. Allows the addition of events and notes to specific tools and reports. You can create individual/confidential events and decide if you want to share them with your team. Add notes, tasks, explanations and remarks to help you follow the impact of the events on the website’s performance. A set of tools with a wide actuation range: Site crawling, monitoring and optimisation; Keyword research, content and page optimisation; Social, web and SERP analytics; Site and social engagement; Link analysis and management; And User and competitive intelligence. In MindSEO we focus our efforts in research, and finding new features and updates for the platform, to ensure that our customers have all the functionalities up to date to optimise their online presence in a more efficient way. S.O.N.A.R. algorithms cross the data gathered by its own crawler with data from multiple third-party APIs, compiling them all together to provide the most accurate and reliable reports. Analyse, monitor and optimise your website with S.O.N.A.R. Tools.